The LA riots were 25 years ago this week, and to mark that anniversary, our co-host Kelly McEvers is visiting key spots around the city. KELLY MCEVERS, BYLINE: Yesterday, we were at Florence and Normandie. That's where the riots started. Today, we are at Pico and Alvarado. That's about six miles north of where we were. We're with Shereen Marisol Meraji from our Code Switch team. Hey. SHEREEN MARISOL MERAJI, BYLINE: Hey. MCEVERS: Tell us why this intersection is important. MERAJI: So when we talk about the riots, we usually talk about tensions between the African-American community, white law enforcement and Korean small business owners. I'm going to tell you a story that complicates that narrative a little bit, and it takes place right here in a neighborhood that's predominantly Latino. UNIDENTIFIED MAN: OK, what's the address there, sir? MIKE HERNANDEZ: 1223 Alvarado Street. We've got flames coming out of the attic, smoke and people inside the building. MERAJI: This neighborhood is called Pico-Union. 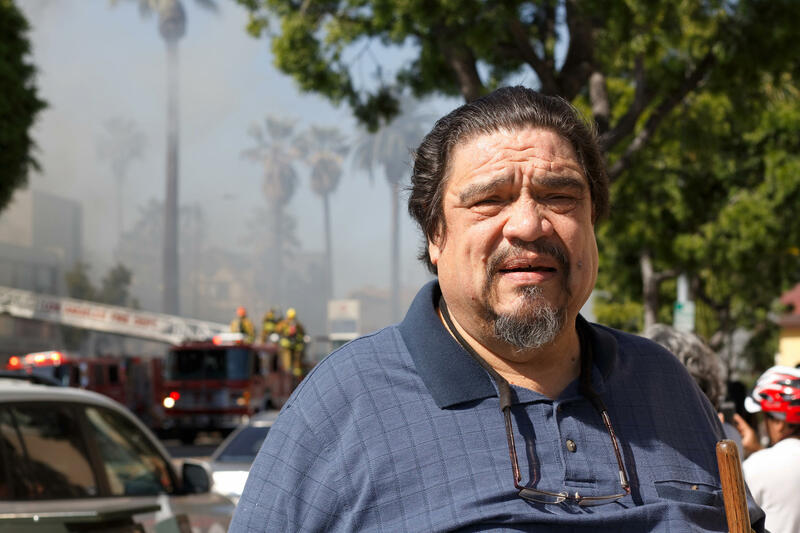 And today, Mike Hernandez is reporting a fire. An Our Lady of Guadalupe plaque swings in the breeze from the second floor of a rundown Craftsman-style duplex; its roof in flames. We find out later no one got hurt, but the scene is eerily coincidental - sirens, a chopper circling, smoke in the air. It is really weird that we're talking about buildings burning down, and there is a building burning down. HERNANDEZ: We had the density here twice of Manhattan's. Our fire station, for example, Fire Station 11, was the busiest fire station in the nation. MERAJI: Hernandez says he knew long before the riots started that Pico-Union was just as combustible as South Central LA. The burning and looting spread here on the second day of the unrest, and he recalls that the few law enforcement he saw were not protecting and serving. He says it's because in the early '90s, Latino was often synonymous with illegal. Here he is talking about it on NPR in 1992. HERNANDEZ: The response to me when I needed the National Guard to protect the people of this area and I needed to protect the businesses, protect the homes, is they gave me the Border Patrol. It was totally an insult. MERAJI: Today, Hernandez is 65. He has a difficult time catching his breath and uses a giant wooden staff to steady his gait. He says time's dulled his memories, but this is something he can't forget. He told me the rioting triggered nightmares of home for the Central American immigrants who had fled civil war. He doesn't deny people in this community looted but says the vast majority were scared out of their minds. And fueling that fear - the presence of what was then called the INS, the Immigration and Naturalization Service, which included the Border Patrol. Hernandez says he couldn't get anyone to pay attention to what was happening in Pico-Union, so he played a little trick on the mayor. HERNANDEZ: I called Tom Bradley's office. I left a message that said I heard they were picking up Nigerians in south LA - INS. About 15, 20 minutes later, I get a call from the mayor. MERAJI: Hernandez knew Mayor Bradley once lived in south LA and some of his most fervent support came from the area's black community. HERNANDEZ: And he's like, Councilman, what is this I hear that INS is picking up Nigerians? And I said, did I say Nigerians? I might have meant Nicaraguans, and maybe it wasn't south LA. Maybe it was Pico-Union. MERAJI: And maybe it wasn't just the INS. Maybe it was the LAPD too. MADELINE JANIS: Wow, this is deja vu. MERAJI: Madeline Janis is flipping through a stack of declarations from Pico-Union residents detained during the riots. Her name came up a bunch of times in Webster Commission documents we found archived in cardboard boxes at the University of Southern California. That was the FBI's five-month investigation into the LAPD's response to the riots. And when I called Janis for an interview, she asked me to bring copies to jog her memory. JANIS: Yeah, I remember this. MERAJI: Back then, Janis, an attorney, ran a Pico-Union-based nonprofit called CARECEN, which is still in the neighborhood and provides all kinds of assistance to immigrants. She told me right after the riots, she helped a couple dozen people facing deportation, people like 18-year-old Salvadoran Martha Campos, arrested by the LAPD at 3 in the afternoon on April 30 while drinking a fruit juice in front of a convenience store. Here's Janis reading from her declaration. JANIS: (Reading) An officer demanded to know my name and if I had any immigration papers and what country I was from. I responded that I had no papers and I told them what country I was from. I was then taken to a police station with many other people. Immigration arrived in several vans and took me and many other people away. MERAJI: Martha Campos' declaration was taken at an immigration detention center in San Pedro, which is about a 45-minute drive from downtown LA 15 days after she was picked up. She says in detention she slept on narrow, concrete benches, was fed dry meat and old bread and not allowed to bathe. She was seven months pregnant. JANIS: (Reading) I fear that the treatment I have suffered while in INS custody could have caused or might still cause serious harm to either me or my baby or both. I declare under penalty of perjury that the foregoing is true and correct to the best of my knowledge and belief. Martha Campos. This was so awful I think I blocked it out of my memory. MERAJI: What happened to Martha Campos shouldn't have. The LAPD wasn't and still isn't allowed to, quote, "initiate police action with the objective of discovering the alien status of a person," unquote. It can only involve immigration enforcement when a, quote, "undocumented alien" has been arrested for serious misdemeanors or a felony. It's a rule called Special Order 40. And it's been around since the late '70s. ROBERT MOSHORACK: What is Special Order 40? I'm not familiar with it. MERAJI: That's Robert Moshorack. He was the district director of the INS in Los Angeles during the unrest, and he's been retired for about 23 years. Moshorack remembers the riots were an all-hands-on-deck situation, and he sent in agents to help as requested - end of story. And as far as Special Order 40, here's how he reacted when I told him about it. MOSHORACK: I think that's ridiculous. Many people don't realize that illegal entry into the United States is a misdemeanor in and of itself, a violation of 8 U.S.C. 1325. And then of re-entry after deportation is a felony. How much longer are we going to accept that in our society? MERAJI: Current LAPD Chief Charlie Beck seems to have accepted that there are a couple hundred thousand LA residents who don't have legal status. CHARLIE BECK: And, you know, I got to be their police chief, too. I'm not just the police chief to property owners. I'm not just the police chief to business owners. MERAJI: Chief Beck's been at the LAPD as long as Special Order 40's been around, and he says he can't recall a time it wasn't followed, even after I told him about the Webster Commission documents that show otherwise. Regardless, he says, it's long been crucial that the LAPD isn't thought of as immigration enforcement because it erodes trust, and immigrants stop reporting crime. Just last month, LA Mayor Eric Garcetti expanded Special Order 40 to include firefighters, port and airport police. The mayor says he's trying to quell fears stoked in LA's immigrant communities by President Trump's call for more cooperation between local law enforcement and federal immigration authorities. ERIC GARCETTI: So to make our city safer, we're focused on keeping those bridges from being burned down right now. MERAJI: I remind Garcetti this city burned down 25 years ago, and Special Order 40 appears to have been an afterthought amidst the chaos. 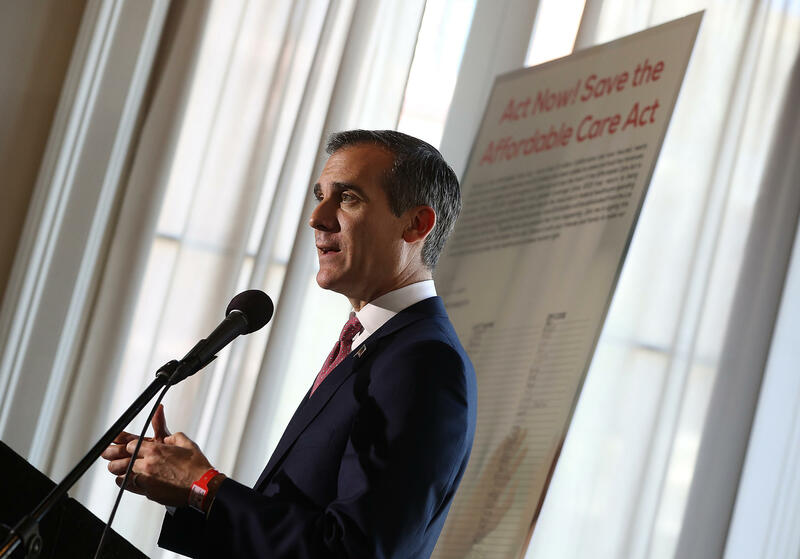 GARCETTI: It's one thing to have a policy or a law on the books, but it's another thing to make sure that it is enforced and enforced by everybody. And this new generation of police officers has come up understanding this both from moral and practical terms. We're not perfect, but in this imperfect paradise that we call Los Angeles, I think we're better and more resilient because of what we went through in 1992. MERAJI: Shereen Marisol Meraji, NPR News. Transcript provided by NPR, Copyright NPR.